All commercial premises are subject to The Regulatory Reform (Fire Safety) Order 2005 of England and Wales. This ‘Order’ sets a standard for fire safety with the employer, or owner, as the ‘Responsible Person’. The ‘Responsible Person’ must conduct a Fire Risk Assessment to ensure that the commercial building meets certain standards. However, regulations and minimum standards adapt depending on the size and type of building, the number of employees and whether or not you have guests. More importantly, however, you may be putting yourself, your employees and your customers at risk! 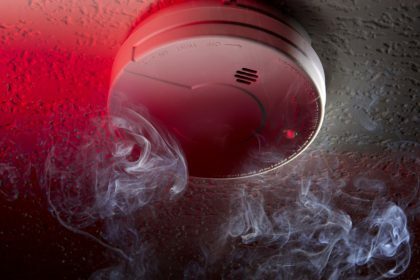 Most commercial buildings will most likely require a combination of Smoke Detectors, Optical Smoke and Heat Alarms, which are hard-wired throughout the building. However, the type of fire alarm system and features necessary will depend on the size of the building and type of commercial or industrial activities. At Paul Hunt Electrical Installations, we appreciate that the safety of you, your staff and customers is paramount. It is important to ensure you have the warning as soon as possible to increase your escape time. Our team is certified to design, install and maintain new and existing fire alarm systems. We will support you to provide the best solutions for your workplace, whether it is a conventional fire alarm system or an addressable Fire Alarm System. Conventional Fire Alarm Systems detect and sound an alarm to warn of a fire risk. They are common in offices and small-medium shops as they are the cost-efficient solution to fire safety. However, you can update a conventional system and improve protection with communicators to quickly inform the emergency services. Our team have experience in installing Addressable fire alarm systems, which call-out when the system detects fire. These systems are ideal for large industrial warehouses with a large amount of staff to evacuate. Contact Paul Hunt Electrical Installations today to discuss fire regulations and installing or updating an existing fire alarm system.